With her research, Ph.D. candidate April Boin Choi looks to identify ways to increase early detection of autism in infants. Autism affects tens of millions of individuals around the world, but the ability to detect the disorder in young children remains nearly impossible. That may change, thanks in part to the research of Ph.D. candidate April Boin Choi, who has spent her early career studying the disorder and believes that doctors might one day be able to diagnose autism starting in infancy. Choi, Ed.M.’13, began researching autism first as an undergraduate studying neuroscience. She was frustrated by the lack of ability to apply her research directly to individuals with autism, and her desire to bridge science, education, and psychology led her to the Mind, Brain, and Education master’s program. Now, in the fifth year of the Ph.D. Program, Choi is working to develop better ways of identifying the development of autism in young children, particularly in children who have an older sibling with autism and who are themselves at higher risk of developing the disorder. “Autism affects about 1 percent of the general population. For at-risk children, that number jumps to 20 percent,” says Choi, who believes the average age for detection of autism in children — around age 4 — is too late. “It means that those children may not have the access to resources and support that are especially critical during the earliest years of life,” she explains. As a possible pathway to earlier diagnosis, Choi is examining forms of communication, specifically hand gestures. Although researchers have long studied gesturing in preverbal children, less is known about gesturing in high-risk populations. Working in the Boston Children’s Hospital Lab of Cognitive Neuroscience, directed by Professor Charles Nelson, Choi has been able to study a cohort of infants at high risk for developing autism. 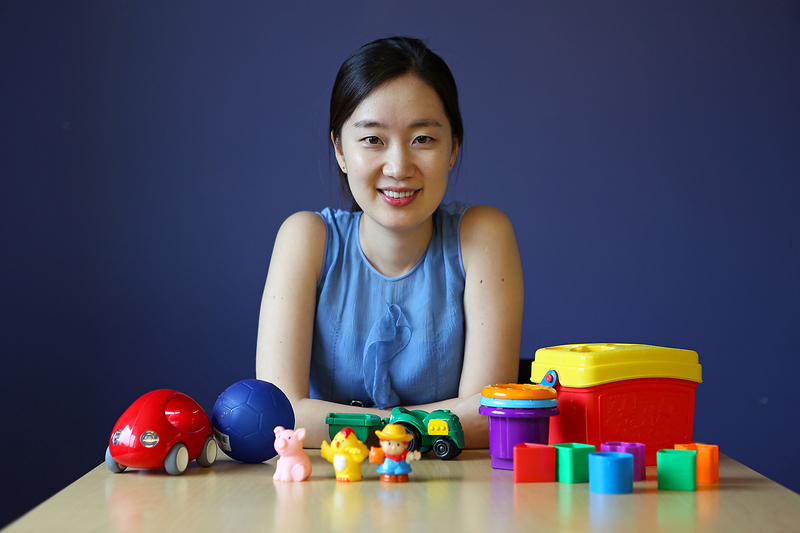 “We found that high-risk infants produce fewer gestures, and that infants with fewer gestures at age 1 were later found to have more language difficulties by age 2 and were more likely to receive autism diagnoses,” says Choi. Nelson isn’t the only one who believes in Choi’s work. In April, she received one of three fellowships through the Novak Djokovic Foundation and the Center on the Developing Child at Harvard. The 2018–2019 grant, which begins this fall, will support her “ground-breaking research,” according to the foundation. Through the fellowship, Choi is excited to build interdisciplinary thinking skills and translate her science-based research to a wide range of stakeholders, especially for children and families back home in Korea, where she plans to return after her dissertation. Despite the fact that nearly 1 in 38 children in Korea is diagnosed with autism, one of the highest rates in the world, there is still a massive stigma attached to the disorder there, resulting in under-diagnosing and fewer support resources for families. Children also report high levels of social exclusion and bullying. There is also a personal motivation for Choi, as she has a close family member with autism in Korea. “Having a family member [with autism] instilled in me the commitment to work with autistic students and the core belief that all students can reach their full potential through quality education,” she says. Choi says she hopes her research can continue to bridge the gap between autism research and the negative cultural stigma that still exists around the disorder. “I want to work in the research world and the outreach world, to hopefully positively impact students and families with autism in Korea and around the world,” Choi says.